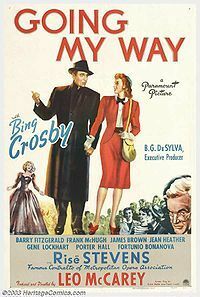 Going My Way, a 1944 film directed by Leo McCarey. It is a light-hearted musical comedy/drama about a new young priest (Bing Crosby) taking over a parish from an established old veteran (Barry Fitzgerald). Crosby sings five songs in the film. It was followed the next year by a sequel, The Bells of St. Mary's. This picture was the highest-grossing picture of 1944. Its success helped to make movie exhibitors choose Crosby as the biggest box-office draw of the year, a record he would hold for the remainder of the 1940s.